Heating and cooling systems - KMW Engineering Sp. z o.o. polyfusion and electrofusion techniques - polypropylene PP-R. 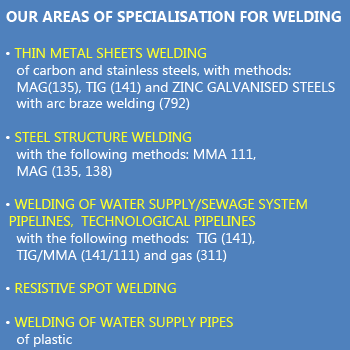 The welding quality system is supervised by the certified welding engineering personnel, IWE, with recognised European and international certificates issued by IIW and EWF. The welding works are performed by certified welders with qualifications conforming to the following standards: EN 287-1 and EN ISO 9606-1. The welding works are inspected by non-destructive tests (NDT) inspectors qualified at the second level in accordance with the EN 473 and EN ISO 9712. The company and its employees hold numerous licences and certificates from independent international companies and institutions.